The Pink Toque» Knit & Crochet Showcase Tutorials » Lila: A Combination Knit & Crochet Baby Blanket – FREE Pattern! 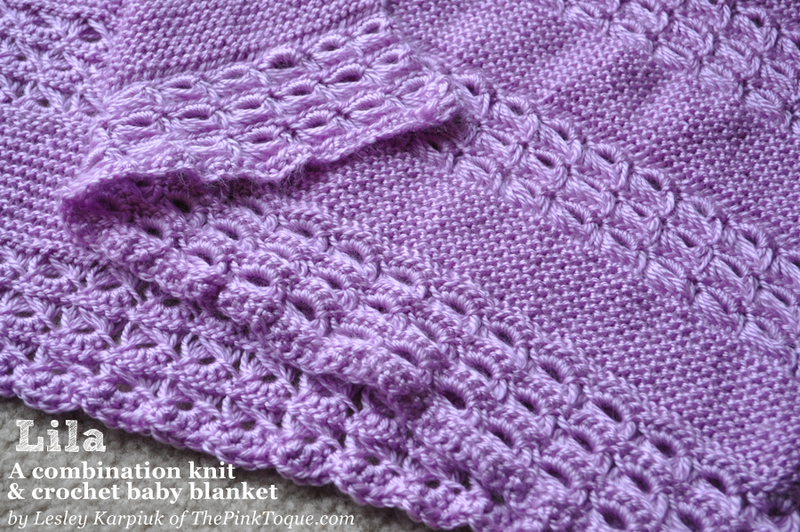 Home Knit & Crochet Lila: A Combination Knit & Crochet Baby Blanket – FREE Pattern! 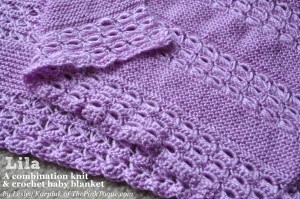 Lila: A Combination Knit & Crochet Baby Blanket – FREE Pattern! With our second baby, Lila, on the way (I can’t believe she’s due next month!) I of course had to whip up a baby blanket. I didn’t want to use the same pattern that I used for Liam just to mix things up a bit, and spent days going through patterns on Ravelry to find just the right blanket but couldn’t decide. I was torn on whether I wanted to knit or crochet; I prefer the look of knit, but crochet is so much quicker for me. What’s an indecisive pregnant mama to do?! I stumbled upon a Lion Brand pattern that both my husband and I liked the concept of, but I wasn’t super fond of the look of the particular lace it used, nor the fact that it was knit from the corner and increased from there. It got me thinking of doing something similar with alternating lace and garter panels, but with “prettier” lace. And knit flat across, back and forth, instead of increased from the corner. I somewhat recently learned broomstick lace crochet, and I remember thinking it could easily transition to knitting needles to do a combo project, and the idea was born to make a baby blanket from alternating broomstick lace crochet and garter knit stitch panels. I couldn’t find anything like it, so I just decided to take notes and possibly write up the pattern to share later. I finished the blanket about a week before Christmas, but just got around to formatting the pattern to share publicly this weekend. And as I’ve mentioned that it’s a combination of crochet (broomstick lace) and knit (garter stitch), you need to be able to do these two different techniques to be successful with following the blanket pattern, but I promise it’s super easy otherwise. I also included a quick video clip I took of myself transferring the stitches from the knitting needles after doing a garter panel back to do another broomstick crochet panel, so I think that will help. Of course, if you have any questions, don’t hesitate to let me know either in the comments or via email. GRAB THE PATTERN ON RAVELRY HERE! I really love how the blanket turned out! Mine ended up being 20″ x 30″ unblocked. I really need to block it, because in my test swatch, blocking really made the broomstick lace panels pop beautifully. I’m sure I’ll get that done before Lila arrives next month, right? Happy knit/crochet! Hope you enjoy the pattern.